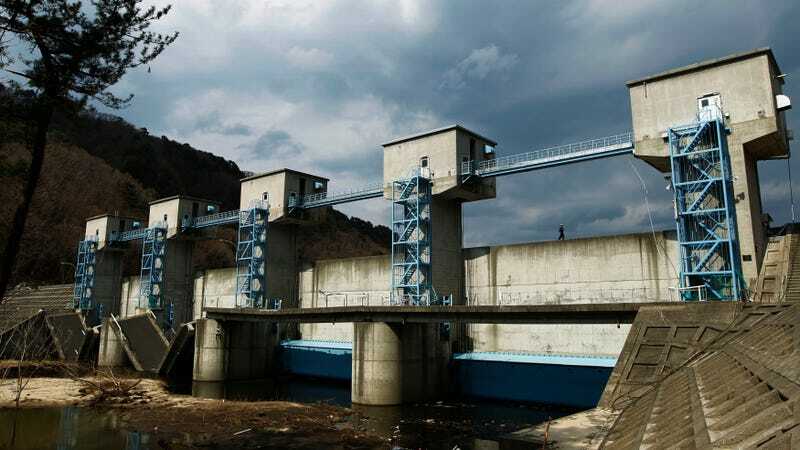 A 50 foot-high floodgate in Iwate Prefecture, northeastern Japan. The tsunami that struck Indonesia’s Sulawesi island and killed at least 1,400 people sadly won’t be the last. Human populations will continue to live along coastlines in tectonically active parts of the world, tsunamis will continue to occur, and people will continue to die. That doesn’t mean we should just sit back and do nothing about it. As it turns out, there are ways in which we can physically shield ourselves from these fearsome natural outbursts. Here are a just handful, from those that already exist to ideas currently within the realm of science fiction. Tsunamis—massive waves propagate horizontally through the ocean—are triggered by anything that can displace a large volume of water, from certain types of earthquakes and volcanic eruptions to landslides. Sea walls, which have been around since at least the time of Ancient Rome, are a popular low-tech option for shielding coastal residents from their destructive power. For some time, Japan’s tsunami-prone eastern coastline had several small breakwaters along it—barriers designed to protect coastlines from strong waves—as well as similar scale sea walls. Unfortunately, these defenses proved ineffective during the 2011 Tōhoku tsunami, which killed around 18,000 people. Many have since been replaced with a 245-mile (395-kilometer) long, 41-foot (12.5-meter) high series of concrete walls at the cost of nearly $13 billion. The 2011 tsunami, which reached heights of 128 feet (39 meters) in some areas, would still easily go over that new wall. But in deflecting part of the tsunami’s energy, the wall offers some degree of protection. Tad Murty, adjunct professor at the University of Ottawa and vice president of the International Tsunami Society, also emphasized that walls only offer partial protection. To achieve total protection, a new idea is emerging in the field. “You have to kill the tsunami when it’s still in the ocean,” he told Earther. The Rama Setu strait off southeastern India. Tsunamis race horizontally toward the shore like Slinky toys. If that Slinky can be cut up into pieces as it’s moving, it will weaken and dissipate before it arrives. This, it turns out, can be achieved with well-placed islands. For a natural example of how this can work, take the 2004 Indian Ocean tsunami. While this event killed hundreds of thousands of people across a wide region, surprisingly few deaths occurred in Kanyakumari in southern India. There, various islands and coral reefs, including the Rama Setu strait, deflected the incoming wave. “They broke the tsunami into pieces,” Murty said. As China has demonstrated in recent years, building artificial islands isn’t too difficult if you have the resources. Each coastline is different, and you would need laboratory experiments and computer simulations to work out the precise placement of islands needed to interrupt an incoming tsunami. But in theory, it could work—although the idea has yet to be put into practice. Murty said there’s some talk of using all the plastic waste in the oceans to build these artificial islands, thereby killing two very different birds with one stone. Artificial islands may not be the only tsunami killers we’ll have available in the future. A rather eye-catching 2017 Heliyon paper by Usama Kadri, a lecturer in applied mathematics at Cardiff University, suggested that anti-tsunami cannons could also one day be a reality. It’s all about acoustic-gravity waves. These ultra-low frequency sound waves are generated naturally by things like earthquakes, and it’s already been suggested they could act as early warning signals for the tsunamis. Kadri’s calculations suggest that we could use acoustic-gravity waves to disrupt tsunamis. By firing strong acoustic-gravity waves back at an incoming wave, we could potentially change its shape, spreading its total energy out over a larger area and reducing its impact on the shore. In theory, these cannons could keep firing until a tsunami is completely dispersed. This isn’t possible just yet. A huge amount of energy would be needed to generate necessarily powerful acoustic-gravity waves, and those waves would need to be finely tuned at a moment’s notice. Describing it as “a great engineering challenge,” Kadri told Earther that laboratory experiments are in progress that aim to provide a proof-of-concept design. It will be a long time before coastal populations are able to live free of the fear of a tsunami crashing into them. That means shelters are of vital importance, but certain countries are keener to deploy them than others. Their designs also vary considerably, ranging from hardened, waterproof bunkers to shelters placed on high ground that can keep people inside alive for days or weeks. Murty explained that on much of the Indian coast, thousands of “extremely well built,” tropical cyclone shelters sit high above the flood line, preventing them from being overwhelmed by surge. Able to accommodate several hundred people, they are used not just for shelter, but as schools, community centers, makeshift hospitals, and more. The United States’ Pacific seaboard, which will one day be hit by a colossal tsunami, doesn’t really have a shelter system like this in place, but things are gradually changing. In 2014, the nation’s first purpose-built tsunami shelter was built into the school in Washington. The building was reinforced with concrete and steel, and the gym was lifted to the second story, where it can shield 1,000 people from a potent tsunami passing below. A pod by Survival Capsule, which is developing floating tsunami shelters. This vertical shielding can be seen elsewhere in the world. The Nishiki Tower in Taiki, Japan features a haven on the top floor that will keep 250 people from getting swept up in a tsunami. Post-2011, along parts of country’s eastern coastline, buildings must now be elevated to similar heights. Private companies are building prototypes of shelters, too. One, STATIM— Storm, Tornado and Tsunami Interconnected Modules—has patented a design for a sheter that’s essentially a smaller version of India’s cyclone bunkers featuring easy and cheap construction. A key difference here is that although tethered to the ground, these shelters can float and would allow the people inside to literally ride out the waves. Experts all agree that there’s far more to saving lives than physical shields and shelters, all of which are only possible if the country has the resources to construct them. Up-to-date, extensive early warning systems, as well as the education of the public, are also vital. “What I know is that any physical defense could fail,” he said.